NASA will host a media teleconference at 1:30 p.m. EDT Wednesday, June 13, to discuss a massive Martian dust storm affecting operations of the agency’s Opportunity rover and what scientists can learn from the various missions studying this unprecedented event. 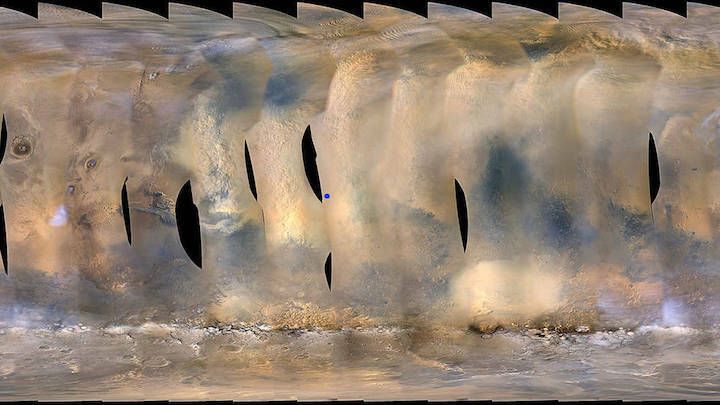 The storm is one of the most intense ever observed on the Red Planet. As of June 10, it covered more than 15.8 million square miles (41 million square kilometers) – about the area of North America and Russia combined. It has blocked out so much sunlight, it has effectively turned day into night for Opportunity, which is located near the center of the storm, inside Mars' Perseverance Valley. To participate, media must email their name and affiliation to Elena Mejia at elena.mejia@jpl.nasa.gov or call 818-393-5467 / 354-5011. NASA engineers attempted to contact the Opportunity rover today but did not hear back from the nearly 15-year old rover. The team is now operating under the assumption that the charge in Opportunity’s batteries has dipped below 24 volts and the rover has entered low power fault mode, a condition where all subsystems, except a mission clock, are turned off. The rover’s mission clock is programmed to wake the computer so it can check power levels. If the rover’s computer determines that its batteries don't have enough charge, it will again put itself back to sleep. Due to an extreme amount of dust over Perseverance Valley, mission engineers believe it is unlikely the rover has enough sunlight to charge back up for at least the next several days. 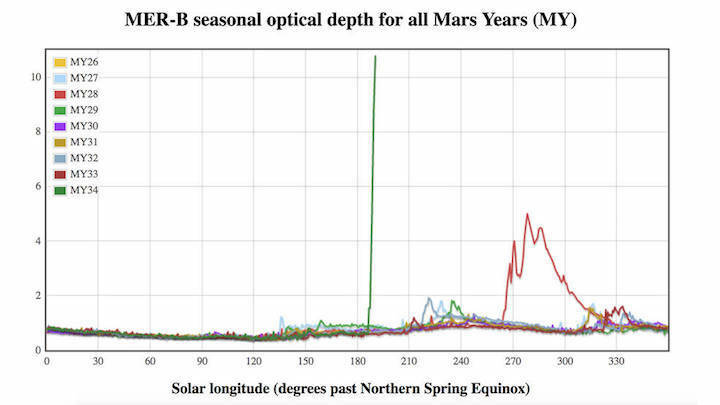 The Martian dust storm that has blotted out the sun above Opportunity has continued to intensify. 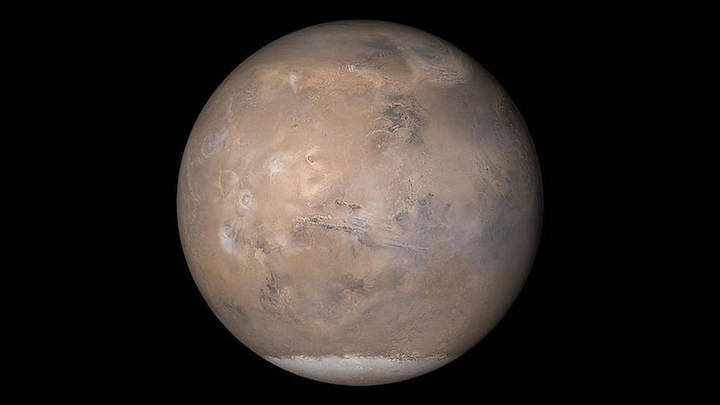 The storm, which was first detected on May 30, now blankets 14-million square miles (35-million square kilometers) of Martian surface -- a quarter of the planet. NASA is holding a news teleconference on Wednesday, June 13, to discuss the storm and the observations of it by various spacecraft. 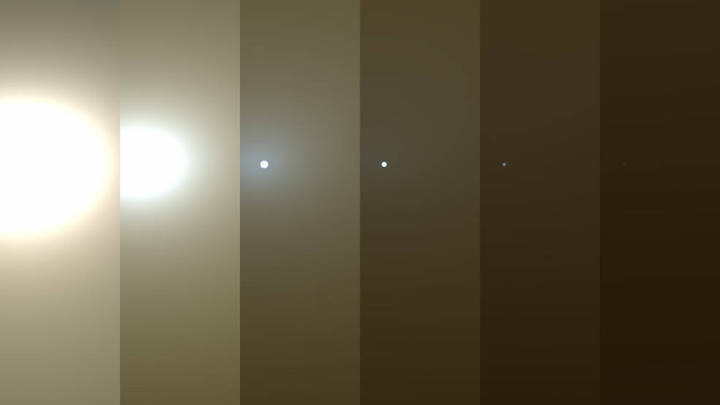 This series of images shows simulated views of a darkening Martian sky blotting out the Sun from NASA’s Opportunity rover’s point of view, with the right side simulating Opportunity’s current view in the global dust storm (June 2018). NASA engineers received a transmission from Opportunity on Sunday morning — a positive sign despite the worsening dust storm. Data from the transmission let engineers know the rover still has enough battery charge to communicate with ground controllers at NASA’s Jet Propulsion Laboratory in Pasadena, California. Science operations remain suspended. Sunday's transmission was especially good news considering the dust storm has intensified in the past several days. A dark, perpetual night has settled over the rover's location in Mars' Perseverance Valley. The storm's atmospheric opacity — the veil of dust blowing around, which can blot out sunlight -- is now much worse than a 2007 storm that Opportunity weathered. The previous storm had an opacity level, or tau, somewhere above 5.5; this new storm had an estimated tau of 10.8 as of Sunday morning. Opportunity's team has requested additional communications coverage from NASA's Deep Space Network, a global system of antennas that talks to all the agency's deep space probes. This latest data transmission showed the rover's temperature to be about minus 20 degrees Fahrenheit (minus 29 degrees Celsius). One saving grace of dust storms is that they can actually limit the extreme temperature swings experienced on the Martian surface. The same swirling dust that blocks out sunlight also absorbs heat, raising the ambient temperature surrounding Opportunity. Engineers will monitor the rover's power levels closely in the week to come. The rover needs to balance low levels of charge in its battery with sub-freezing temperatures. Its heaters are vitally important to keeping it alive, but also draw more power from the battery. Likewise, performing certain actions draws on battery power, but can actually expel energy and raise the rover's temperature. The rover has proved hardier than expected by lasting nearly 15 years, despite being designed for a 90-day mission. This global map of Mars shows a growing dust storm as of June 6, 2018. The map was produced by the Mars Color Imager (MARCI) camera on NASA's Mars Reconnaissance Orbiter spacecraft. The blue dot indicates the approximate location of Opportunity. Science operations for NASA's Opportunity rover have been temporarily suspended as it waits out a growing dust storm on Mars. NASA's Mars Reconnaissance Orbiter first detected the storm on Wednesday, May 30. When the orbiter team saw the storm nearing Opportunity, they notified the rover's team to begin preparing contingency plans. In a matter of days, the storm had ballooned. It now spans more than 7 million square miles (18 million square kilometers) -- an area greater than North America -- and includes Opportunity's current location at Perseverance Valley. More importantly, the swirling dust has raised the atmospheric opacity, or "tau," in the valley in the past few days. This is comparable to an extremely smoggy day that blots out sunlight. The rover uses solar panels to provide power and to recharge its batteries. Opportunity's power levels had dropped significantly by Wednesday, June 6, requiring the rover to shift to minimal operations. This isn't Opportunity's first time hunkering down in bad weather: in 2007, a much larger storm covered the planet. That led to two weeks of minimal operations, including several days with no contact from the rover to save power. The project's management prepared for the possibility that Opportunity couldn't balance low levels of power with its energy-intensive survival heaters, which protect its batteries from Mars' extreme cold. It's not unlike running a car in the winter so that the cold doesn't sap its battery charge. There is a risk to the rover if the storm persists for too long and Opportunity gets too cold while waiting for the skies to clear. Ultimately, the storm subsided and Opportunity prevailed. The Martian cold is believed to have resulted in the loss of Spirit, Opportunity's twin in the Mars Exploration Rover mission, back in 2010. Despite this, both rovers have vastly exceeded expectations: they were only designed to last 90 days each. Opportunity is in its 15th year; the team has operated the rover for more than 50 times longer than originally planned. Full dust storms like this one are not surprising, but are infrequent. They can crop up suddenly but last weeks, even months. During southern summer, sunlight warms dust particles, lifting them higher into the atmosphere and creating more wind. That wind kicks up yet more dust, creating a feedback loop that NASA scientists still seek to understand. Mars Reconnaissance Orbiter and two other NASA spacecraft orbiting the Red Planet --Odyssey and MAVEN -- routinely support rovers on the ground.